Calendars – Are you ready for 2019 !! 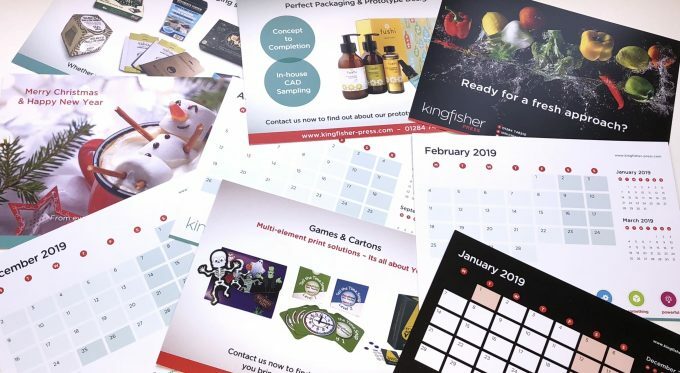 Kingfisher Press Calendar – Getting ready for 2019!! Time flies when you have so much to do before Santa visits on Christmas Eve. It’ll be time to stop for the Christmas break before you know it and your Kingfisher Press calendar 2019 will be called in to service for the year ahead! We’ve been very busy this month with a variety of projects leading up to the Christmas Break. One of which is our very own 2019 calendar! We have some superb images on the calendar this year show casing a range of print solutions including digital, litho and wide format print. This year features books, boards and games, all printed here at Kingfisher Press, along with vibrant images showcasing colour print at its best. The leopard Jetpress page will always be the favourite page here at Kingfisher. It show just how accurate the High Definition digital print of the Jetpress 720s can be. It’s unbelievable it can print such tiny print so accurately! You have to see it to believe it!! If you would like to find out more about the jetpress 720s then please visit the Jetpress page on our website here. If you haven’t seen a copy of our calendar before then please do get in touch. The popular A5 Landscape design makes it an easy to use desk calendar. If you would like to find out more about Kingfisher Press please visit our website here. Perfect for short runs & quick turnarounds. Jetpress high definition digital print.